A few weeks ago we spent a wonderful couple of days with Federico Orsi of Orsi San Vito and Roberto Maestri of Quarticello in their native Emilia-Romagna. We delved deep into the region, enjoying an eight vintage vertical of sparkling Malvasia di Candia, our weight in homemade salami and mortadella, plenty of tortellini in brodo and one of the meals of our lives at the Osteria del Mirasole in the Colli Bolognese. In a few weeks time Federico and Roberto will join us in London to celebrate their region at two very special events. 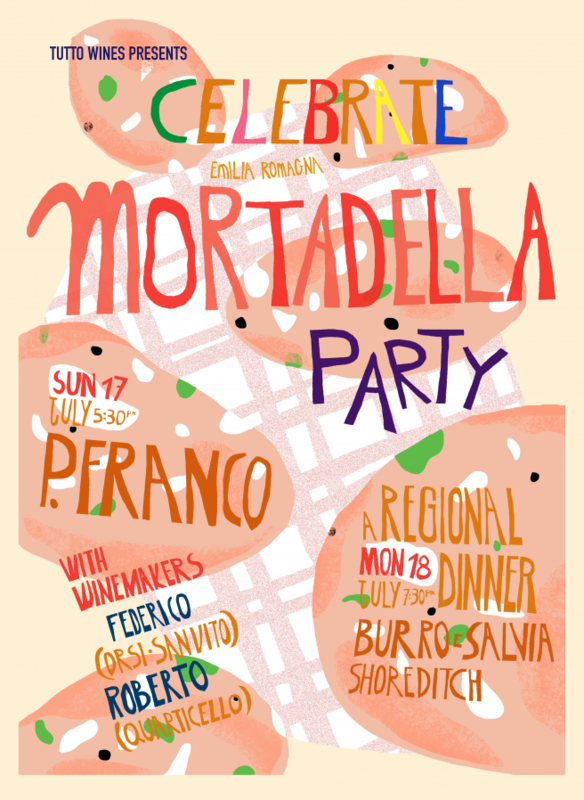 On Sunday 17th July we will welcome the guys to London with another Mortadella Party at P.Franco. Federico’s Mortadella is a thing of legend. It is made from local Mora Romagnola pigs who roam free and feed on wheat, barley, fava and wild herbs on his farm. Federico breaks down the whole beast and adds a little salt, pepper, herbs and a good glug of his wine and the result is the best we have tried. We’ll be slicing it thin, stuffing it in panini and pouring glasses of fizz from the boys from 5:30pm until late. There is no need to book just come by for a few glasses and a sandwich. Having said that, last year we did sell out of ten kilos of the stuff in a couple of hours, so remember, the early fella gets the ‘della, so to speak. On Monday 18th July we are heading to the lovely surrounds of Burro e Salvia Pastificio in Shoreditch, where Federico and Roberto will be hosting an intimate dinner inspired by the region. The pastificio is one of the great places to eat proper pasta in London and Luca’s menu below has got us just a little excited.